I am here to tell you that nine miles is a long way. The run started out like all of the others except that my ipod was doing this strange skipping thing which made me half insane. The only thing I could think of during the whole run was how happy I was going to be to get back home and have a bloody, beer, coffee, and or mimosa. Maybe one or two of each. 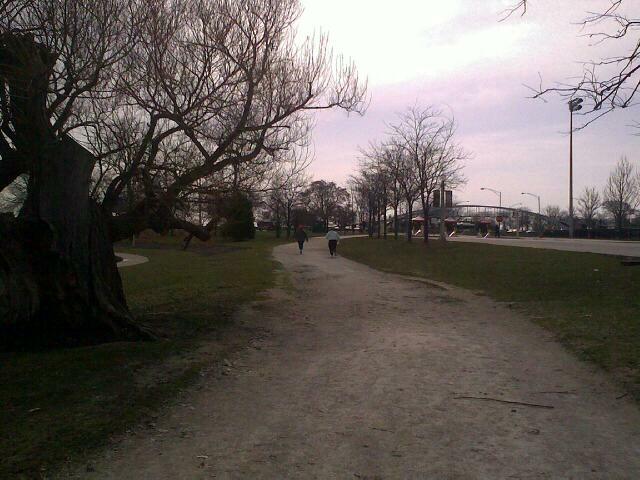 We started at our normal spot and headed up north on through the park and over to the lakefront path. The morning wasn’t that bad really, a little windy with a bit of a chill, but not too bad. I think we were all a little nervous about how long it was going to take and how FAR it really is. I kept my bus pass in my water bottle holder just in case. You just never know when you are going to finally have enough. We went at a 4:2 pace. That worked very well for me in the youthful miles, but as they started to creep up, just after Cricket Hill past Montrose I about died I was thrilled when K said we’d bring the pace back to a 3:2. By mile 8.5 I was struggling. I was doing anything to avoid running. I took some shots of the cloudy morning just north of downtown. I was nearly dead at this point, but, we made it. After stretching we drank, ate and laughed our butts off for the rest of the day. So fun. Strange how distance perception has changed since the beginning of this training, the 6 mile run scheduled for this coming Saturday is considered a short one…what am I thinking??? Training updates here. Since the last training post, there has been some progress…last Saturday we were up to 7.5 sunny miles at the lake. Beautiful and refreshing. I don’t mean to sound like an ad for Sprite, but it was an amazing day. I am not saying here that I wasn’t exhausted and sore at the end, but the day was fantastic. My gma pal K totally irritated me with her ability to “join in”. Yes folks, she just decided that morning to do the full run walk with us. She completed the run with us and was in much better shape than I was. How did she do that? My point being this, just because you didn’t run yesterday, doesn’t mean you can’t run today.